Located in northeastern Vermont, 3,267 foot Burke Mountain towers over the surrounding landscape. During the Great Depression, the Civilian Conservation Corps had a camp located near the present day mid-mountain base area. Two ski trails were cut, Wilderness and the popular Class A racing trail Bear Den. Burke's lift served skiing history dates back to early 1955, when Ski Burke Mountain, Inc. was formed. The State of Vermont required the investors to come up with an estimated $50,000 in funds to prove it would be a viable project, before issuing a lease. Served by its now-legendary Poma lift, the ski area also tied in the Bear Den Trail (a class A hike-up race trail), the Wilderness Trail, and the toll road into its initial network of skiable terrain. The Poma lift opened in early 1956. A new $126,000 access road was completed in 1958, improving the winter approach to the ski area. At this point, the ski area was served by the Poma lift and a rope tow. 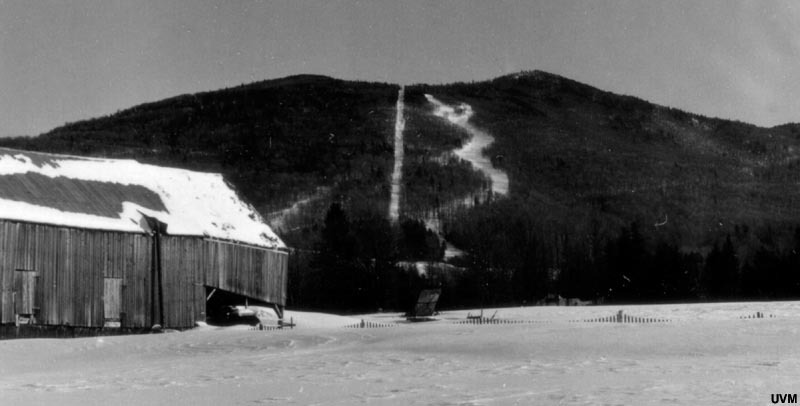 While Burke was operating as a sizable surface lift area for a decade, the growing Vermont ski industry threatened to leave it behind. As such, a major expansion took place for the 1966-67 season, centered around the installation of Burke's first chairlift. In addition to the lift, the base lodge was doubled in size and 20 acres of skiable terrain added. Additional trails and a Poma lift were advertised as added for the 1968-69 season. Warren Witherell established Burke Mountain Academy near the ski area in 1970. The popular racing trail Warren's Way was later named for the legendary coach. 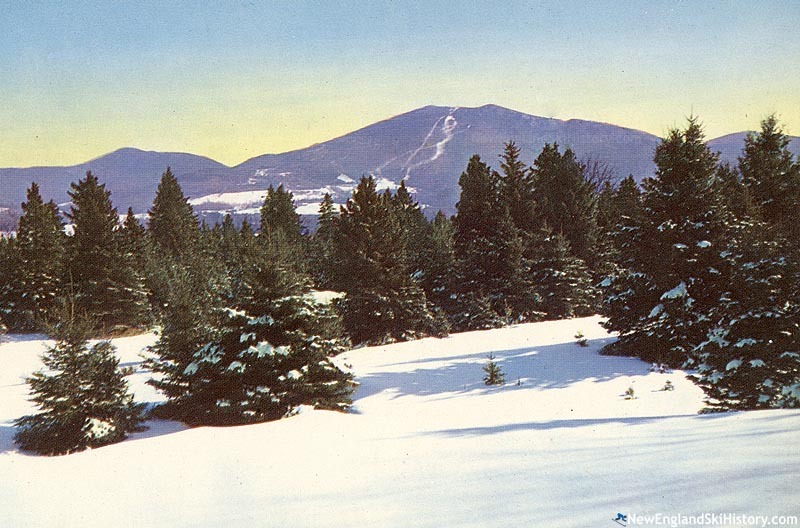 Coinciding with the extension of Interstate 91 through Lyndonville, a lower mountain chairlift and base lodge were added for 1978-79 season, pushing the ski area's vertical drop over the 2,000 foot mark. While the new complex seemed promising, it reportedly lacked snowmaking and thus sat idle for its first two seasons. Though future expansion was planned for East Bowl and West Peak, the area reportedly went bankrupt in 1987. Developer Paul Quinn acquired Burke in September 1987 with plans to turn it into a four season resort featuring 11 lifts, including relocating the summit double to East Bowl and opening West Peak. While summit double chairlift was upgraded to a fixed grip quad for the 1988-89 season, progress stalled as the real estate market went south. Burke would go on to struggle financially, declaring bankruptcy in 1990. Bernd and Karin Schaefers acquired the ski area circa the fall of 1991. Plans were announced to turn Burke into a center for film festivals, a la Sundance, as well as constructing a Bavarian castle themed hotel and microbrewery. However, Burke was once again bankrupt in 1995. The Northern Star Ski Corporation acquired Burke in 1995 and began improving the trails and infrastructure. However, after back to back bad seasons, Northern Star President Andy Holmes announced the area's lender had withdrawn and that an ownership change would be imminent. 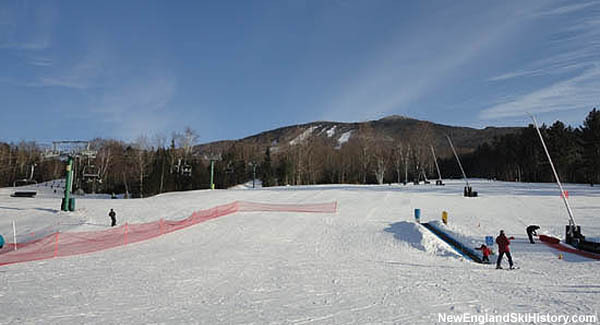 In September of 2000, Burke Mountain Academy acquired the ski area at auction for a reported $300,000, placing it in a company called Burke 2000 LLC. In 2005, the area was transferred to Lubert-Adler and the Ginn Corporation. 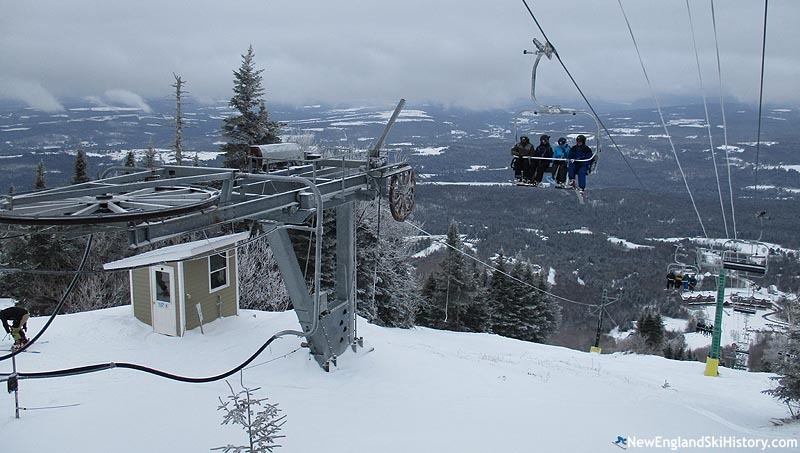 Following the acquisition, Burke underwent a significant transformation, as its first high speed quad opened on the lower mountain for the 2005-06 season. Soon thereafter, the Ginn-Lubert-Adler partnership came under severe strain as the real estate crisis escalated. Burke 2000 was eventually placed under LRA BURSKI, LLC, which was in turn owned by Lubert-Adler's Legacy Resort Assets. A second high speed quad was announced for the 2011-12 season, though installation hit some snags. Initially intended to be a refurbished lift from Ascutney, negotiations didn't work out. As a result, a new Leitner-Poma high speed quad was purchased, opening on Christmas Eve. 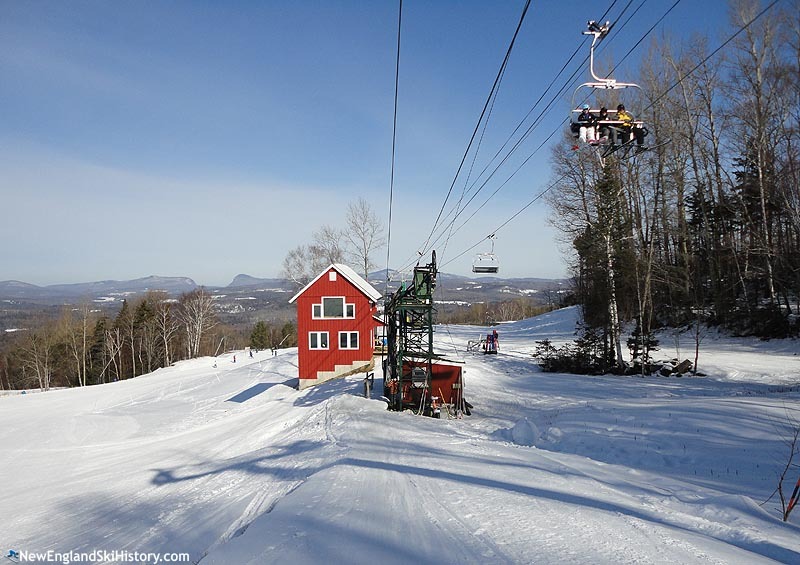 Perhaps in part due to the financial strain of the poor 2011-2012 winter, as well as the finances needed to install and operate the new lift, LRA BURSKI, LLC sold the ski area to Jay Peak owner Ariel Quiros in May 2012 for $7.26 million. While on mountain investment was made into the snowmaking system, Quiros and business partner Bill Stenger quickly turned their attention to a $98 million investment plan involving a hotel, conference center, aquatic center, and tennis facility. Quiros and Stenger had previous experience with the EB-5 program, as they had raised hundreds of millions of dollars to fund projects at Jay Peak. Quiros formally renamed the ski area to Q Burke Mountain Resort in 2013, prompting scorn from many longtime skiers and local residents. In June 2014, ground was broken for the $50 million hotel, which was expected to open for the 2015-16 season. While construction was completed in early 2016, the hotel remained closed. On April 13, 2016, the Securities and Exchange Commission raided and took control of Q Burke, alleging that Quiros and business partner Bill Stenger defrauded EB-5 immigrant investors with a complex Ponzi scheme. Leisure Hotels and Resorts was installed as the operator while the government appointed receiver worked to stabilize and eventually sell the ski area. Later that month, the Burke Mountain name was restored, coinciding with reassurances that the hotel would debut in the fall and that the ski area would remain operating. With the area now operating under a receivership, the Poma lift served its last skiers in the spring of 2017. The historic lift was removed that summer, making way for a new high-speed T-Bar. "Love Burke! First skied there early 1970s, the addition of the detachable has been great, & now it's the last run of the poma as word is a t-bar will replace it next year. I'll miss the poma lift! Love the mid mountain lodge -- great blend of the old & new & the trails rock"
"First skied here in the 59/60 season. As I remember one long Poma platter pull lift to the top, and a rope tow just below the lodge. I was a member of the Lyndon Institute ski team. Although not very good at racing I enjoyed the skiing. Lyndon had the New England state champion high school ski team that year. The coach was Don Erskin. Team members included the Beattie brothers, all three of the Smith brothers, Art Sanborn, Dave Jenkins, Peter King, Greg Peck, Gary Cassidy, to name a few. We used to take the old 'red bus' up to the area for practice and meets. It was an old, maybe 47-48 Chevy sedan, chopped in half and a section added in the middle. Looked like an old fashioned limo. With no heat! I taught my future wife how to ski on the rope tow slope in the early 60's. We still take a run or two at Mt Baker here in Washington. Glad to see the area is still operating." "My Aunt and Uncle used to own a condo there at the base of the beginner chair, and I skied there several times in the 1980s, back when they still had just two double chairs and the two pomalifts too. Because we were by then Colorado skiers my 1st wife and I really liked the wide trails over by the Dipper poma and I thought that maybe they should have replaced that lift with a chair and possibly extended it further uphill too, which might have helped mitigate that really long walk back from the East Bowl somewhat too.Better yet, why not an East Bowl lift and snowmaking over there too?Back when the main mountain chair was a double it used to get pretty crowded, and then we would ride the school poma instead, which covered probably 2/3rds of the vertical anyway, as it never had any lift line either. I did ski there once after the fixed-grip quad was installed and that new lift did-in most of the waiting in liftlines too. My aunt and uncle sold their place there sometime in the 1990s and I haven't been back since. Maybe under Jay's ownership some of the long-promised improvements can be undertaken and Burke can realize all of the promise that so many people saw in the place over many years only to be left disappointed for so many years too. " "In the 60s and early 70s I lived in Littleton NH but used to ski Burke rather than Cannon Mt because of the lack of lift lines. Many a frosty morn my two daughters amd myself would get up early and load the car and off to Burke for a great day of sking. in the late 50s and early 60s I remember the poma lift. " "My entire childhood from third grade to graduation was wrapped around the ski season at Burke. Every year that season tickets were available I got an early Christmas present. Favorite trail then was The Powderhorn. I made lifetime friends riding the Saturday bus from St. J to the mountain and I fell in love there for the first time to my 8th grade sweetheart. What that really means is the chairlift ride became romantic. It still takes my breath away 37 years later when my husband and I (not the guy from the chairlift) drive to the top in the summer or fall while we're there visiting. It was a safe place then in the late 60's and 70's, where you could pack a lunch, leave it on a table and it would still be there when you got back. The french fries from the snack bar were "